This website deals with the Herring Gulls of the taxa argentatus and argenteus. Argenteus is an abundant breeding species on Iceland, Britain, NW France, Belgium, the Netherlands and N Germany. The taxon argentatus breeds in NE Europe, from Denmark, the coast of the Baltic Sea, Scandinavia and coast of the White Sea. In the centre of the breeding range (Denmark and the NW German coast), birds show intermediate characteristics, indicating there is a cline in argenteus-argentatus. Argenteus in Western Europe is pale-backed, slightly smaller and with relatively much black in the wing-tip; argentatus in the NE Europe is larger, slightly darker on upper-parts and show less black in the wing-tip. On these web-pages, we largely follow P.J. 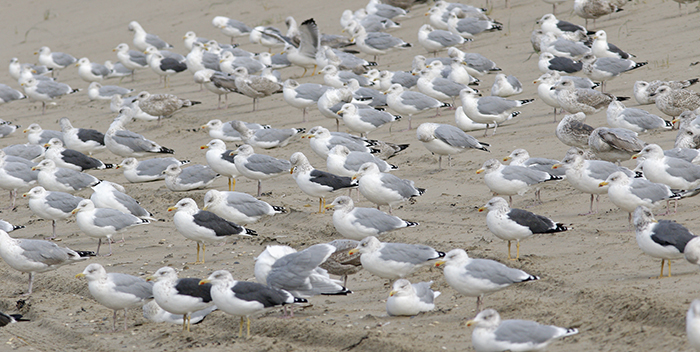 Grant: "Gulls, a guide to identification" and E.K Barth's publication as Contribution No. 86, Zoological Museum, University of Oslo: "The circumpolar systematics of Larus argentatus and Larus fuscus with special reference to the Norwegian populations". Adults are in active primary moult. The tables below present the primary moult stage by early and mid-October. adult Herring Gull, primary moult score at Boulogne/Mer, NW France, October 05 2002. 1. adult birds identified by primary covert pattern and bare part coloration. 2. all birds present in the resting group scored. 3. P5...P8 new = the longest primary present in the folded wing, longer than the previous ranked primary, but remember this primary may not be fully grown in some birds. 4. new primaries: total (n) = 203; average (m) = 7.1; standard deviation (SD) = 0.63. 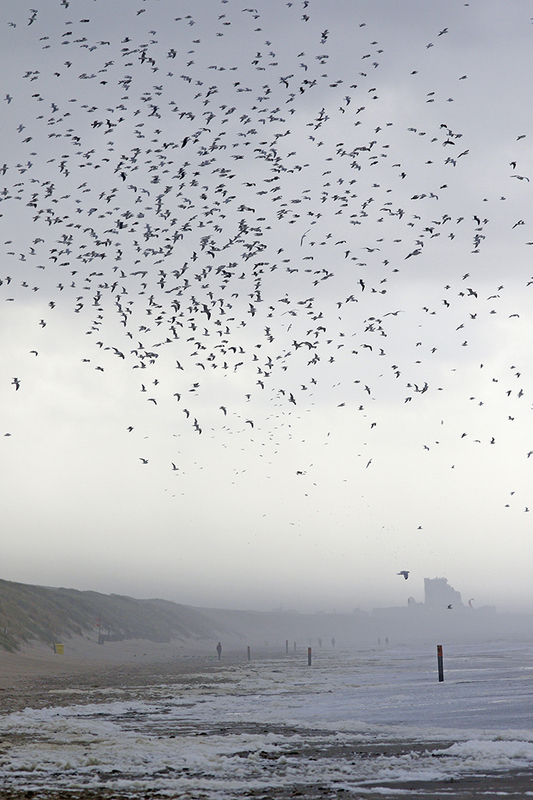 5. old primaries: total (n) = 203; average (m) = 9.8; standard deviation (SD) = 0.50.
adult Herring Gull, primary moult score at Scheveningen, the Netherlands, October 17 2002. 4. new primaries: total (n) = 67; average (m) = 7.4; standard deviation (SD) = 0.65. 5. old primaries: total (n) = 67; average (m) = 9.8; standard deviation (SD) = 0.59. 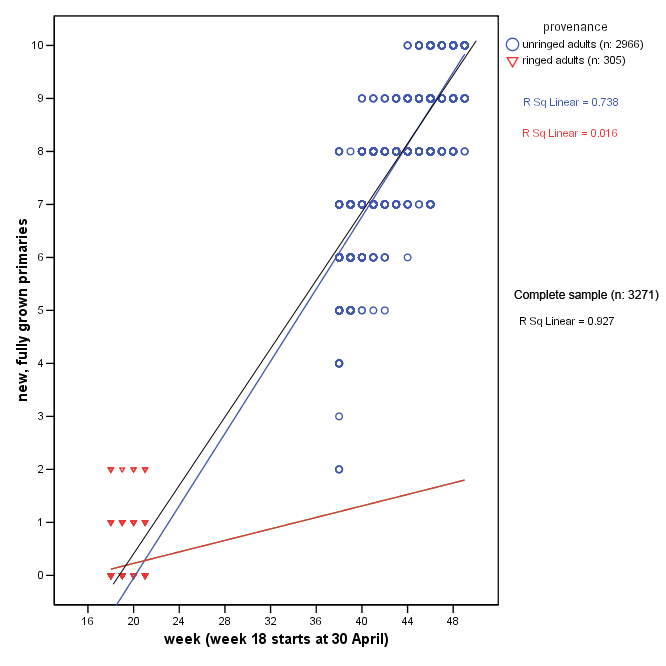 Long term analysis for primary moult score (PMS). Table above, data for the Netherlands (2000-2010), results for spring & summer (aggregated week): number of remaining old primaries in adults. 0 = 0 old primaries left (P10 dropped); 10 = all 10 primaries still old and present. Above: Scatter Plot for PMS in adult Herring Gulls. Number of remaining old primaries throughout the year. Sample size is 1.329 birds. Table above, data for the Netherlands (2000-2010), results for autumn & winter (aggregated week): number of new, fully grown primaries in adults. 0 = no new primaries visible. So either P1 still old, or P1 dropped, but the very tip still not visible. 1 = P1 longest new primary. Range between "at least the tip of P1 is visible" until "tip of P2 still shorter than P1". 2 = P2 longest new primary. 3 = etc. Above: Scatter Plot for PMS in adult Herring Gulls throughout the year. Longest new primary is classified "fully grown". Sample size is 3.271 birds. Birds scored on NEW primaries. 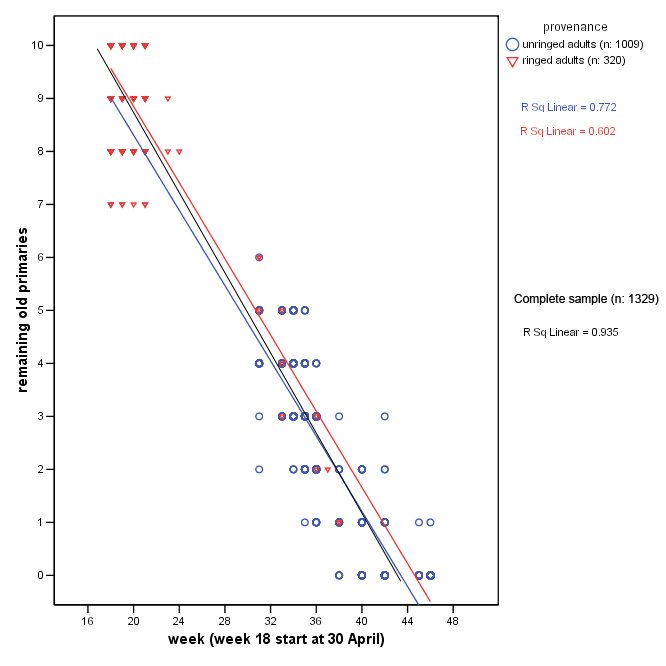 The first date in our analysis on adult Herring Gulls is 02 May 2006 (week 18 - starting 30 April), on which we already found birds with missing primaries (some birds had already shed 3 primaries). This group of actively moulting birds, 43% of the sample, must have started the complete moult somewhere around mid-April and probably several birds may have started earlier. The last scoring day has been 03 December, when still 20% of the sampled birds had to grow P10. The final stage of the complete moult for all birds has to be somewhere after mid-December. On 03 December we scored 59 birds with P10 fully grown, 13 birds with P9 fully grown and 2 birds with P8 fully grown. They all had no old primaries left. The first time a new primary (P1) was visible, was also on 02 May 2006 (week 18 - starting 30 April). In this week, 90% of the sample did not show new primaries, but 9% did. Four birds in the sample of 115 birds alreday had P2 as longest primary (fully grown). As soon as the tip of P1 was visible, this was automatically scored "fully grown", and this was the case in 7 birds. For the other primaries to be scored fully grown, they had to exceed the previous primary in length (so P2 fully grown, only from when it is longer than P1). Onset of primary moult can best be illustrated by a sinusoid for the first few weeks and last weeks, but there appears to be linear dependency over much of the central moult period. PMS = -0,379* WEEK + 16,324. PMS = 0,322* WEEK - 6,071. Herring Gull AD8.T ad (argenteus), October 27 2010, Westkapelle, the Netherlands. Herring Gull (argenteus) UA9.T March 2010 & May - December 2015, IJmuiden, the Netherlands. Herring Gull T2A adult (argenteus, October 01 2008, Boulogne/Mer, France (50.42N,1.34E). Picture: J-M Sauvage. Herring Gull CZAN 4+cy (argenteus), October 01 2009, Westkapelle, Netherlands. Herring Gull GCAC adult (argenteus), October 30 2009, Westkapelle, the Netherlands (51.33N-03.25E). Herring Gull argenteus KNAR adult, October 17 2015, Boulogne-sur-Mer, France. Picture: Jean-Michel Sauvage. Herring Gull KPAL adult (argenteus), October 23 2009, Boulogne/Mer, France (50.42N,1.34E). Picture: J-M Sauvage. Herring Gull (argenteus) adult PJAT October 31 2012, Boulogne-sur-Mer, NW France. Picture: Jean-Michel Sauvage. Herring Gull H-47720 adult (argenteus), October 20 2009, Boulogne/Mer, France (50.42N,1.34E). Picture: J-M Sauvage. Herring Gull H-112079 9cy (argenteus), October 04 2008, Boulogne/Mer, France (50.42N,1.34E). Picture: J-M Sauvage. Herring Gull H-117482 adult (argenteus), October 28 2008, Boulogne/Mer, France (50.42N,1.34E). Picture: J-M Sauvage. Herring Gull H-119123 adult (argenteus), October 19 2002, Westkapelle, the Netherlands (51.33N-03.25E). Herring Gull H-130477 adult (argenteus), October 11 2003, Westkapelle, the Netherlands (51.33N-03.25E). Herring Gull (argenteus) BLB H-132077 adult, October 30 2016, Scheveningen, the Netherlands. Herring Gull (argenteus) H-151443 adult, October 2009, August 2010 & September 2011, Westkapelle, the Netherlands. Herring Gull argenteus BLB H-161236 July 2010 & October 2014, Le Portel, NW France. Picture: Maarten van Kleinwee & Jean-Michel Sauvage. Herring Gull (argenteus) 9||Z adult, October 22 2017, Brouwersdam, the Netherlands. Herring Gull (argenteus) B||4 adult, October 01 2018, Scheveningen, the Netherlands. Herring Gull (argenteus) B||Y adult, October 23 2018, Noordwijk, the Netherlands. Herring Gull (argenteus) D||R adult, October 20 2018, Scheveningen, the Netherlands. Herring Gull G||5 adult, October 26 2017, Katwijk, the Netherlands. Herring Gull K||1 adult, October 26 2017, Katwijk, the Netherlands. Herring Gull (argenteus) P||V adult, October 01 2018, Scheveningen, the Netherlands. Herring Gull (argenteus) 08 adult, April 2011 & October 2016, Maasvlakte & Katwijk, the Netherlands. Herring Gull (argenteus) RE 8CY, October 03 2016, Katwijk, the Netherlands. Herring Gull (argenteus) 0.N adult, October 2011 - November 2015, Scheveningen & Maasvlakte, the Netherlands. Herring Gull (argenteus) 8.W adult, October 31 2016, Scheveningen, the Netherlands. Herring Gull (argenteus) 79 adult, October 22 2017, Brouwersdam, the Netherlands. Herring Gull (argenteus) 7H adult, October 08 2017, Noordwijk, the Netherlands. Herring Gull (argenteus) 7M adult, October 30 2016, Scheveningen, the Netherlands. Herring Gull (argenteus) A9 adult, October 23 2018, Noordwijk, the Netherlands. Herring Gull (argenteus) T4 adult, October 21 2018, Scheveningen, the Netherlands. Herring Gull argenteus U3 adult, October 05 2016, Katwijk, the Netherlands. Herring Gull (argenteus) UT adult, October 03 2016, Katwijk, the Netherlands. Herring Gull WF adult, October 31 2016, Scheveningen, the Netherlands. Herring Gull 5W 6cy (argenteus), October 2012, Boulogne/Mer, France (50.42N,1.34E). Picture: J-M Sauvage. Herring Gull PY adult (argenteus), October 01 2009, Boulogne/Mer, France (50.42N,1.34E). Picture: J-M Sauvage. Herring Gull (argenteus) PJ adult, September - October 2010, Westkapelle, the Netherlands. Herring Gull K5 adult (argenteus), October 06 2009, Westkapelle, the Netherlands (51.33N-03.25E). Herring Gull AC adult (argenteus), October 26 2007, Westkapelle, the Netherlands (51.33N-03.25E). Herring Gull (argenteus) 44 2CY & 5CY, October - December 2015; February & October 2018, IJmuiden, Katwijk & Scheveningen, the Netherlands. Herring Gull (argenteus) 9N adult, October - November 2015, Scheveningen, the Netherlands. Herring Gull (argenteus) 9Z adult, October 20 2015, Scheveningen, the Netherlands. Herring Gull (argenteus) A.J adult, May 2015 & October - December 2016, Katwijk, the Netherlands. Picture: Merijn Loeve & Mars Muusse. Herring Gull argenteus JA adult, October 20 2014, Katwijk, the Netherlands. Herring Gull argenteus JD adult, October 05 2016, Katwijk, the Netherlands. Herring Gull (argenteus) KD 2CY-5CY, November 2014 - October 2017, Katwijk & IJmuiden, the Netherlands. Herring Gull (argenteus) K.F adult female, October 08 2017, Noordwijk, the Netherlands. Herring Gull (argenteus) Z3 adult, October 20 2015, Scheveningen, the Netherlands. Herring Gull (argenteus) ZS adult, October - December 2015, Scheveningen, the Netherlands. Herring Gull (argenteus) 2D adult, October 29 2018, Noordwijk, the Netherlands. Herring Gull (argenteus) JR adult, October 08 2017, Moerdijk, the Netherlands. Herring Gull (argenteus) VR adult, October 2015 & September 2016, Westkapelle, the Netherlands. Herring Gull (argenteus) XY adult, October 03 2016, Katwijk, the Netherlands. Herring Gull (argenteus) Y.APV adult, November 2015 & October 2016, Katwijk, the Netherlands. Herring Gull Y.AHY adult (argenteus), October 09 2009, IJmuiden, the Netherlands. Herring Gull (argenteus) Y.BAH adult, July 2014 & October 2017, IJmuiden, the Netherlands. Herring Gull (argenteus) Y.BAX adult, April, September & November 2015, IJmuiden, the Netherlands. Herring Gull (argenteus) Y.BCB adult, October 18 2017, IJmuiden, the Netherlands. Herring Gull (argenteus) YBRD adult, June 2014 - October 2017, IJmuiden, the Netherlands. Herring Gull (argenteus) Y.BUL adult, October 23 2018, Noordwijk, the Netherlands. Herring Gull (argenteus) Y.CAA adult, October 23 2018, Noordwijk, the Netherlands. Herring Gull (argenteus) Y.CAN adult, May 2017 & October 2017, Heemskerk, the Netherlands. Herring Gull (argenteus) Y.CHH adult, May 2017 & October 2018, Heemskerk & Scheveningen, the Netherlands. Herring Gull (argenteus) Y.CNZ adult, October 29 2018, Noordwijk, the Netherlands. Herring Gull (argenteus) K.ANC 8CY, October 29 2018, Noordwijk, the Netherlands. Herring Gull F.ABD adult (argenteus), October 09-15 2012, Katwijk, the Netherlands. Herring Gull adult female FAJS February 2014, October 2015 & September 2017, Katwijk & Westkapelle, the Netherlands. Herring Gull JR9 10cy (argenteus), October 19 2002, Brouwersdam, the Netherlands (51.457N-03.51E). Herring Gull argenteus 1= 29CY-32CY, November - January 2016-2019, Katwijk, the Netherlands. Herring Gull 34 24cy (argenteus, October 09 2011, IJmuiden, Netherlands. Herring Gull DA 24-27cy (argenteus, 2009-2010, Leiden, Netherlands. Herring Gull N adult (argenteus), October 01 2009, Westkapelle, the Netherlands (51.33N-03.25E). Herring Gull B adult (argenteus), October 13 2001, Westkapelle, the Netherlands (51.33N-03.25E). Herring Gull (argenteus) E adult, November 2002 - October 2016, Scheveningen, the Netherlands. Herring Gull argenteus 5.038.584 adult, November 2003 & October 2009, Westkapelle, the Netherlands (51.33N 03.25E). Herring Gull 5.139.994 9cy (argenteus), October 22 2002, IJmuiden, the Netherlands (52.27N-04.33E). Herring Gull (argenteus) NLA 5.229.43x adult, October 18 2017, IJmuiden, the Netherlands. Herring Gull (argenteus) NLA 5.277.846 13CY-25CY, 2004-2016, IJmuiden, the Netherlands (52.27N-04.33E). Herring Gull 5.286.322 adult (argenteus), October 09 2005, Westkapelle, the Netherlands (51.33N-03.25E). Herring Gull (argenteus) NLA 5.293.863 11CY & 25CY, September 2004 & October 2018, Scheveningen, the Netherlands. Herring Gull (argenteus) NLA 5.301.361 21CY, October 09 2015, IJmuiden, the Netherlands. Herring Gull (argenteus) NLA 5.352.682 16CY-17CY, April 2016 & October 2017, IJmuiden & Katwijk, the Netherlands. Herring Gull argenteus NLA 5.352.687 13CY, 16CY & 17CY, November 2013,May 2016 & September-October 2017, Katwijk aan Zee, the Netherlands. Herring Gull (argenteus) NLA 5.360.706 18CY, October 03 2016, Katwijk, the Netherlands. Herring Gull (argenteus) NLA 5.361.238 5CY & 16CY, March 2004 & October 2015, Brouwersdam, the Netherlands. Herring Gull 5.366.897 adult (argenteus), October 19 2009, Boulogne/Mer, France (50.42N,1.34E). Picture: J-M Sauvage. Herring Gull 5.429.309 4+cy (argenteus), October 16 2011, IJmuiden, the Netherlands. Herring Gull (argenteus) NLA 5.463.365 1CY & 6CY, August 2011 & October 2016, IJmuiden & Scheveningen, the Netherlands. Herring Gull (argenteus) NLA 5.471.863 adult, October 23 2015, Brouwersdam, the Netherlands. Herring Gull argenteus NLA 6126321 7CY, October 22 2010, Westkapelle, the Netherlands. Herring Gull (argenteus) NLA 6145427 11CY, October 23 2015, Brouwersdam, the Netherlands. Herring Gull (argenteus) NLA 6.167.666 6CY, October 26 2017, Katwijk, the Netherlands. Herring Gull X994 adult (argentatus), October 02 2001 & October 23 2002, Boulogne/Mer, France (50.43N-01.37E). Herring Gull (argentatus) X6C8 6CY, October 18 2017, IJmuiden, the Netherlands. Herring Gull x246862 adult (argentatus), October 21 2004, Westkapelle, the Netherlands (51.33N 03.25E). Picture Pim Wolf. Herring Gull T41614 15cy (argentatus), October 26 2007, Westkapelle, the Netherlands (51.33N 03.25E). Herring Gull argentatus adult, October 20 2014, Zabieliškis - Kaunas, Lithuania. Picture: Boris Belchev. Herring Gull adult, October 18 2017, IJmuiden, the Netherlands. P7 fully grown. PMS=43. Herring Gull adult, October 13 2015, Katwijk, the Netherlands. P6 fully grown. PMS=42. Herring Gull adult, October 13 2015, Katwijk, the Netherlands. P7 fully grown, P10 old. PMS=39. Herring Gull adult, October 13 2015, Katwijk, the Netherlands. P10 growing. PMS=48. Herring Gull adult, October 13 2015, Katwijk, the Netherlands. P6 fully grown, P9-P10 old. PMS=36. Herring Gull adult, October 07 2012, Noordwijk, the Netherlands. P7 fully grown, P10 old. PMS=40. Greater primary coverts plain grey indicate full adult. Herring Gull adult, October 11 2012, Noordwijkerhout, the Netherlands. P7 fully grown. PMS=43. Greater primary coverts plain grey indicate full adult. Herring Gull (argenteus) adult, October 19 2012, Katwijk, the Netherlands. P10 fully grown. Much black on bill, but plain grey greater primary coverts indicate full adult plumage. Herring Gull adult, October 20 2014, Katwijk, the Netherlands. Herring Gull adult, October 11 2012, Noordwijkerhout, the Netherlands. P8 fully grown. PMS=47. Herring Gull (argenteus) adult, October 19 2012, Katwijk, the Netherlands. P8 fully grown, P9-P10 growing. Plain grey greater primary coverts indicate full adult plumage. Herring Gull (argentatus) adult, October 16 2015, Katwijk, the Netherlands. Herring Gull argentatus adult, October 29 2015, IJmuiden, the Netherlands. Herring Gull adult (argentatus), October 11 2011, Scheveningen, the Netherlands. Herring Gull adult (argentatus), October 20 2003, IJmuiden, the Netherlands (52.27N - 04.33E).